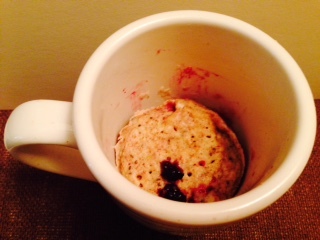 Similar to the cake in the mug, I decided to try my hand a making a muffin in a mug. To those that haven’t heard of this new fangled idea, it’s where you make a single serving cake (or muffin) by mixing the ingredients together in a microwavable mug. 2 minutes later and presto, you have a single serving delicious cake. This idea wasn’t mine, and this isn’t my first attempt at a mug recipe. This is the first one I’m posting, and it came out quite tasty. This morning before I started my work day, I checked Face Book. 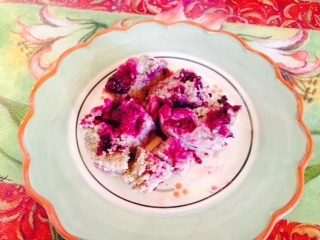 On it, a friend had posted a link to the Today Show, and several recipes for mug cakes. I was pretty taken aback with the ingredients, and the amount of calories, sugar and fat in their recipes listed. I analyzed one recipe with my recipe analysis software, and here are the results. Wow! So, the culprit ingredients included 2 tbsp of butter and 3 tbsp of sugar, and also included white flour. So, as I often do, I decided to try to make a healthier version. And I think it came out delicious. Of course 2 tbsp of butter and 3 tbsp of sugar was most likely more decadent. To that mixture add the remaining ingredients. It should resemble a muffin or cake batter. If too thick add additional milk. Place in microwave and heat for 2 minutes. I have a 1000w microwave. If you have a slower microwave, cook longer. If you have a faster microwave, cook less. You can then eat it directly out of the mug, or flip it out onto a plate. This is what I did. Once I flipped it out, I cut it into chunks and ate it. Yummy. If you’d like to try a gluten free version, I would suggest trying oat or almond flour instead of the whole wheat. I haven’t tried either, but that’s not to say I won’t. My version is also dairy free and can be made vegan by substituting flaxseed/water for the egg. Plus mine had added fiber and omega 3 fatty acids. All in all a good start to the day.